My Right Word: Jerusalem Between Israel, Washington and the "West Bank"
Jerusalem Between Israel, Washington and the "West Bank"
The US Supreme Court on Monday granted certiorari in three cases slated for argument during the October 2014 term. In Zivotofsky v. Kerry, the court will address the constitutionality of a federal statute requiring the Secretary of State, on request, to endorse US passports and Consular Reports of Birth Abroad of US citizens born in Jerusalem with "Israel" as the place of birth. The US Court of Appeals for the District of Columbia Circuit found the statute unconstitutional on grounds that it "impermissibly infringe[d] on the [p]resident's exercise of the recognition power." As I have opined, the case, I think, could be strengthened by pointing out two additional, if quite simplistic, aspects of the affect of the law. 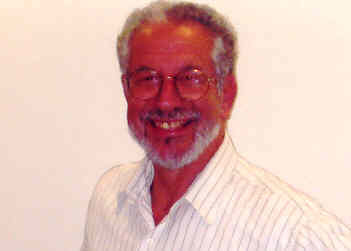 In the first case, not appending a "state" identification would cause a bureaucratic burden in that it could so develop that the United States citizen, birth registered and subsequently carrying a passport without a birth location, if visiting a country with a city named "Jerusalem" could conceivably be ordered to either pay taxes, or be liable for military service or some other civic obligation as if he were a citizen of that other country. In not being able to easily and immediately prove that he was born is another country, i.e., Israel. due to the State Department's regulations and the refusal of the President to follow through on the Jerusalem Act, his lack of country identification on his official papers causes a hindrance that could easily be resolved by adding "Israel". In the second case, State Department regulations at the present recognize something called the "West Bank". 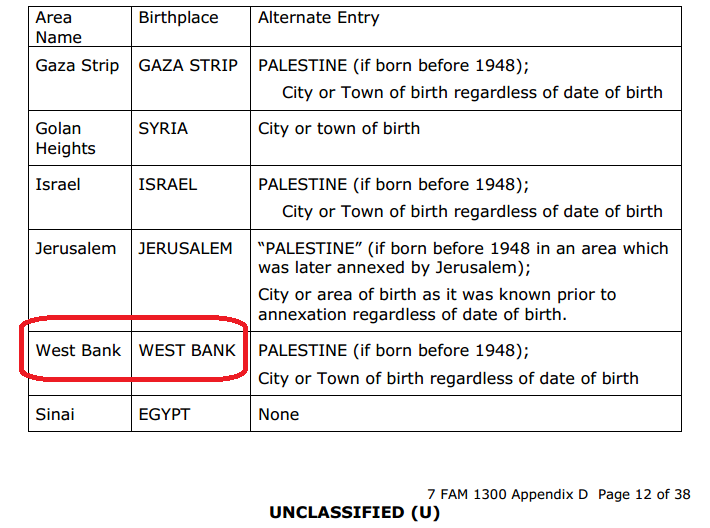 "c. Birth in the West Bank or in the No Man’s Lands between the West Bank and Israel: The birthplace for people born in the West Bank or in the No Man's Lands between the West Bank and Israel is WEST BANK; Those persons born before May 1948 in the area known as the West Bank may have PALESTINE listed as an alternate entry. Those born in 1948 or later may have their city of birth as an alternate entry. Persons born in the West Bank in 1948 or later may not have Palestine transcribed as an alternate entry." Now, as you and I and the State Department well know, there is no state of the "West Bank". g. Birthplace in Area Formerly Known as Palestine: An applicant born in the area formerly known as Palestine (which includes the Gaza Strip, the Golan Heights, Jerusalem or the West Bank) may object to showing the birthplace. In such cases, explain the Department of State (CA)’s general policy of showing the birthplace as the country having present sovereignty. The Senior Passport Specialist, Supervisory Passport Specialist or Adjudication Manager at a domestic passport agency or center or supervisory consular officer or regional consular officer at a U.S. embassy or consulate may make an exception to show PALESTINE as the birthplace if the applicant was born before 1948. If the applicant was born in 1948 or later, the city or town of birth may be listed if the applicant objects to showing the country having present sovereignty. "Sovereignty"? Whoa there. No one has sovereignty, the State Department usually claims as regards Israel so how come it includes that term there? Why is the "West Bank" to be permitted as a supposed sovereign country but Israel which surely has a much better proven sovereign administration, including a capital. a Supreme Court and government offices as well as a seat of government with a residing Prime Minister and a residing President is denied such a status? And as for the term "West Bank", besides not existing as a country/state, the term "West Bank" was first used to describe what the United States considered an illegal occupation and annexation by the Hashemite Kingdom of Jordan of the area in April 1950.
why do they recognize the opposite when it comes to the "West Bank"? Is that logical? Or is that simple bias? In any case, the US Supreme Court should not extend assistance in any legal way to this situation. The Justices should indeed intervene and whether or not it is a matter of constitutionality, there is a simple matter of justice: you cannot treat Israel any less than something, which is non-existent and has much less proof of sovereignty, called the "West Bank". Regarding the first problem, inadvertant liability to taxation, if the Court rules as State requests, all of the US citizens born in the original Jerusalem could, in order to preclude any future mishap, petition for unconditional exemption from taxes in the US, which has Jerusalems in at least 5 states. I have a simpler solution - all US citizens born in Jerusalem, Israel, should simply apply to Misrad Hapnim to mark their US Passports, in large letters, preferably on the page opposite the photo: "The bearer of this document was born in Jerusalem, Israel", along with an official looking stamp. Since it is permitted for Misrad Hapnim to add visas and other annotations to foreign passports, this might be a solution, and would not "infringe" the US President's "right" to determine sovereignty (as though the head of one state can determine the sovereignty of another state over its own territory). There is no inconsistency. The West Bank, like Jerusalem, is given in the State Dept. chart as the "birthplace," not the country of birth. And the US did not recognize the West Bank to be Jordanian territory in the period 1948-1967, just as the US has not recognized any part of Jerusalem as ever being Israeli territory. "Wset Bank" doesn't exist, neither as a place, a location, a territory or a country. that name is made-up to eliminate the existence of Judea and Samaria, names used in the UN Partition Plan delineation of borders.